​​Brook trout are the only native species of trout on the east coast. 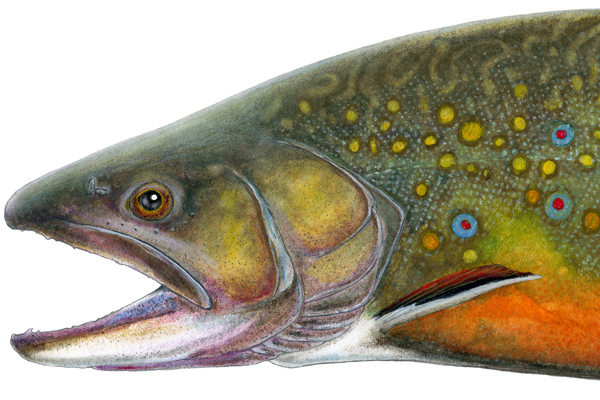 Though populations have been introduced in the western United States, the native range of brook trout includes coldwater streams in the Appalachian Mountains. The species extends as far south as Georgia and continues north through the United States and into Canada. In the history book of fishing, brook trout are one of the founding fathers. Glorified for their vibrant colors and a staple in Native American diets, brook trout were considered a gift from the spiritual leaders. While early European settlers continued to value brook trout as a tasty and plentiful food source, they also were among the first to value the species for recreational purposes. Unfortunately, the arrival of Europeans also meant the beginning of the decline of brook trout habitat. When the Europeans arrived they found what appeared to be an endless supply of timber and used it to construct settlements and fuel fires for long winters. Little did they know, this land use practice removed shade from streams, reduced instream habitat, and increased sediment in streams. Together, this reduced the amount of habitat for brook trout and was the start of species decline. Historically, brook trout were plentiful and large. Today a 12-inch native brook trout might be the catch of a lifetime; however, a hundred years ago it would be a disappointment. There are dependencies as to the size of the world record brook trout, but all reports place the catch somewhere near the turn of the 20th century and weighing over 14 pounds. Why are populations so small now? One report places the world record brook trout at 14.5 pounds caught by Dr. J.W. 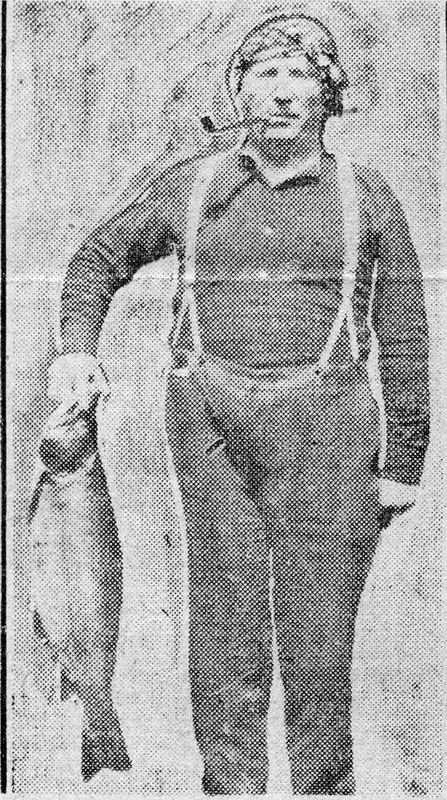 Cook in 1915. Image courtesy of the Nipigon Historical Museum. The cause of brook trout declines is difficult to pinpoint because it is the result of a lot of complex factors working together. Declines in brook trout habitat started with the land use practices of early Europeans, but dramatically increased in the early 1900s with increased human development and large-scale logging practices in many brook trout watersheds. While today's immature forest stands may provide a clue to historic land use, a trained eye can also read the land use history by looking no further than the stream bed. How do streams tell us about forests? 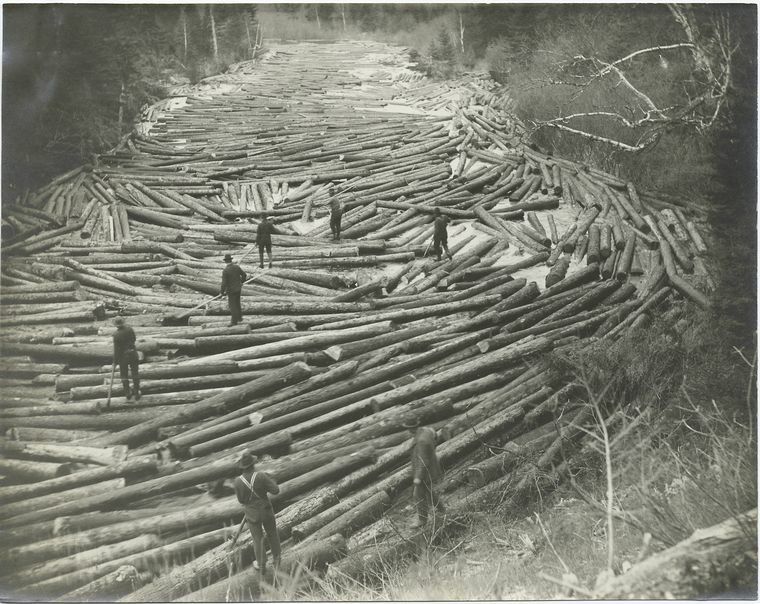 One of the most common historic logging practices was known as log driving. In the winter, crews fell timber and hauled it over slippery snow and ice to the river. During spring snowmelt, high energy river flows would wash logs downstream to a processing station. Thus, the labor-intensive processing of hauling timber was largely eliminated. However, this process was a double whammy to stream habitats. Loss of tress on the streambank reduced shading (thereby increasing water temperature), removed habitat for terrestrial insects that fish commonly eat, and increased the amount of sediment entering streams. While quick regrowth of trees could mitigate some of these effects, logs floating downstream scoured the streambed resulting in long-term, and in some instances permanent, loss of habitat. Further, trees that naturally fall into streams create ideal trout habitat by creating large pools that provide a refuge during high flows. Today, just 100 years following intensive logging, immature tree stands are still actively growing and have largely not contributed to instream habitat. ​In addition to habitat loss, brook trout are threatened by the invasion of nonnative species, most notably brown and rainbow trout. Brown trout, a native of Europe, and the western United States native, rainbow trout, were introduced in the late 1800s to increase recreational angling opportunities. This decision was supported and advocated for by the most knowledgeable fisheries scientists of the time. Little did they know, they were introducing nonnative species that are competitively dominant and would soon cause native brook trout populations to decline due to inability an inability to compete for habitat and food. The competitive advantage of brown trout is, in part, due to the species' preference for warmer water. Land use changes and warming atmospheric conditions are increasing stream temperatures causing stress to brook trout and shifting the advantage further in favor of brown trout. As a result, brook trout are becoming increasingly isolated in the most upstream sections of streams where populations are isolated and at increased risk of extinction. For many streams, it is only a matter of time before streams get too hot, brown trout move in, and brook trout are only a memory. What is the future of brook trout? The Appalachian ecological and atmospheric climate is not only new, but unpredictable. Even the most sophisticated models fall short of forecasting even short-term changes in brook trout populations. In many ways, we simply don't know what's next. But, what we do know is that natural resource conservation is only possible when science and stakeholders join forces to root for the same opponent. Brook trout are down, but not out. The species is of high conservation status in most of its native range thereby providing increased protection against human activities that may negatively affect trout populations. Brook trout also remain one of the most studied species of fish, and numerous organization such as Trout Unlimited, the Eastern Brook Trout Venture, and the Chesapeake Bay Foundation provide significant resources towards the research and conservation of populations. The purpose of The Troutlook is to take research an extra step and make it more accessible to the general public. We believe that conservation, while often guided by science, can only be enacted by the public. However, scientists do a poor job of fostering this partnership by hiding important information behind privacy walls and complicated jargon. We can do better. In fact, we must do better. Brook trout, and countless other native species, are depending on us to get this right.